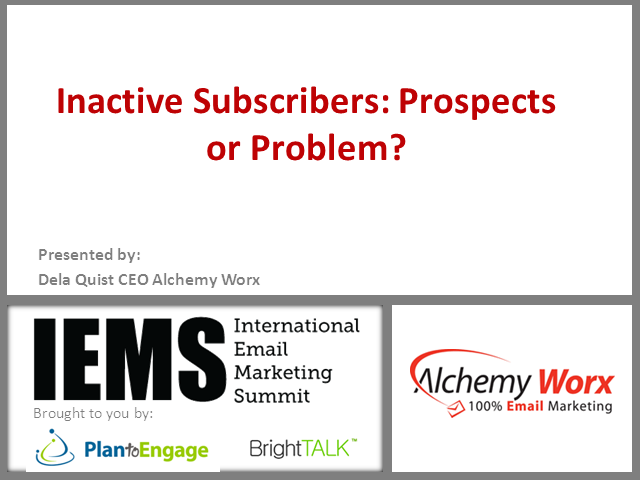 Deciding what to do with your inactive subscribers is one of the most vexing issues facing email marketers. Standard practice recommends removing inactive subscribers, and although that might seem like good advice, does it make commercial sense? Dela will tell you whether a long-term non-opener really doesn't like your company or just isn't ready to buy and suggests ways to reactivate the inactive. Title: Inactive Subscribers: Prospects or Problem?